While Glitzkoin was conceptualized to create a positive impact on the multibillion dollar diamond industry, we remain equally committed to the crypto community that has been a staunch supporter of the project. Trading on the Stellarport exchange since July 2018, the GTN token has added 50% to its ICO value. Crypto enthusiasts would recollect that, the Glitzkoin ICO was successfully completed in June 2018 at a token price of $0.20. It was November and December 2018 when BTC (Bitcoin) the ‘king of the crypto kingdom’, lost as much as 70% of its value – pulling down the entire crypto market. Amazingly, GTN which was until then trading around its ICO value ($0.20), surged up to $0.30 – supported by active trading from seasoned crypto traders. We at Glitzkoin constantly explore opportunities to increase demand for the GTN token. With the DiaEx trading platform set for a Q1 – 2019 launch, diamond traders operating on the platform, would soon generate an additional stream of demand for the token. GTN is the designated mode of payment on DiaEx. The first quarter of 2019, would see the launch of yet another avenue of demand for the Glitzkoin GTN token. 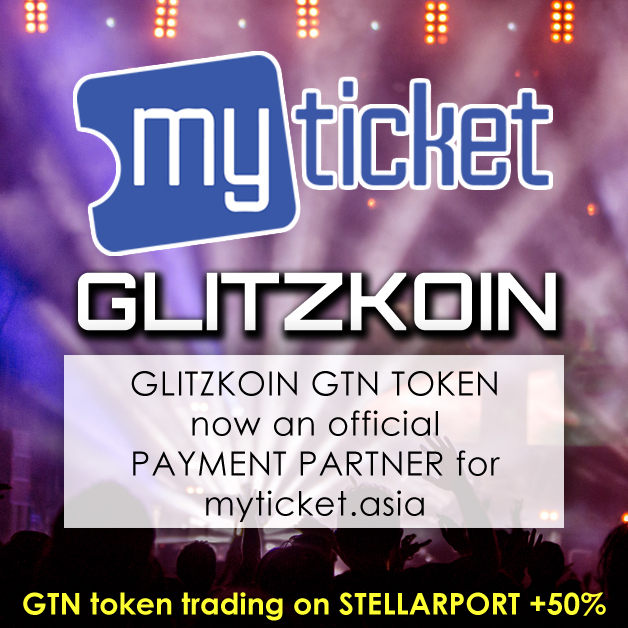 Myticket.asia and Glitzkoin have officially inked a deal where, the GTN token would be a payment partner on the popular, ticketing and entertainment portal. The technical integration for the operation is currently under development. Efforts are on to tie up with various business houses, the idea is to have them accept the GTN token as a mode of payment. Expect to see more updates on this as we, begin testing the concept as a pilot scheme in 2019.